Check out Tobi's Be That Girl Lace Up Skirt Who can resist a stripe in summer? 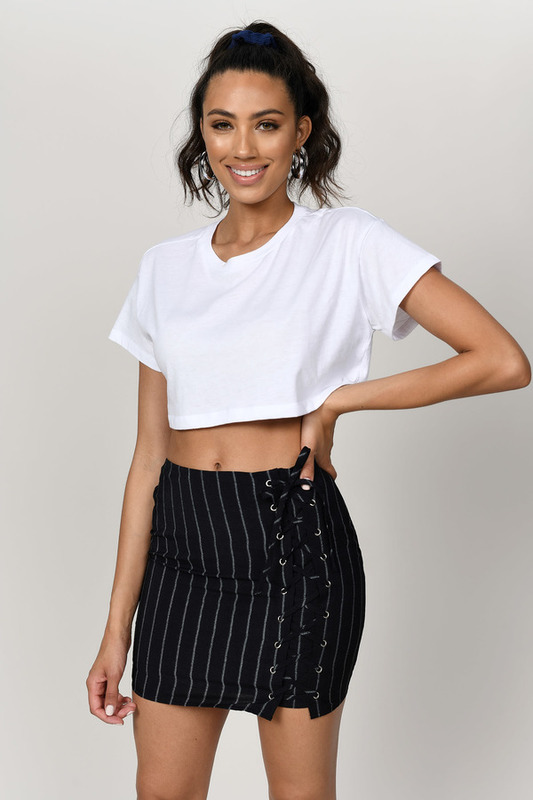 With a lace up eyelet detail all the way up one side, the Black Be That Girl Lace Up Skirt is a lightweight, fitted mini skirt that will bring vacation vibes to any outfit. Perfect for sunny days. Who can resist a stripe in summer? With a lace up eyelet detail all the way up one side, the Navy & White Be That Girl Lace Up Skirt is a lightweight, fitted mini skirt that will bring vacation vibes to any outfit. Perfect for sunny days. Who can resist a stripe in summer? With a lace up eyelet detail all the way up one side, the Black Be That Girl Lace Up Skirt is a lightweight, fitted mini skirt that will bring vacation vibes to any outfit. Perfect for sunny days. Black, Navy & White modeled on a size Small.